What’s better than the Macy’s Last Minute Gift Sale? A FREE Macy’s Cash Card! 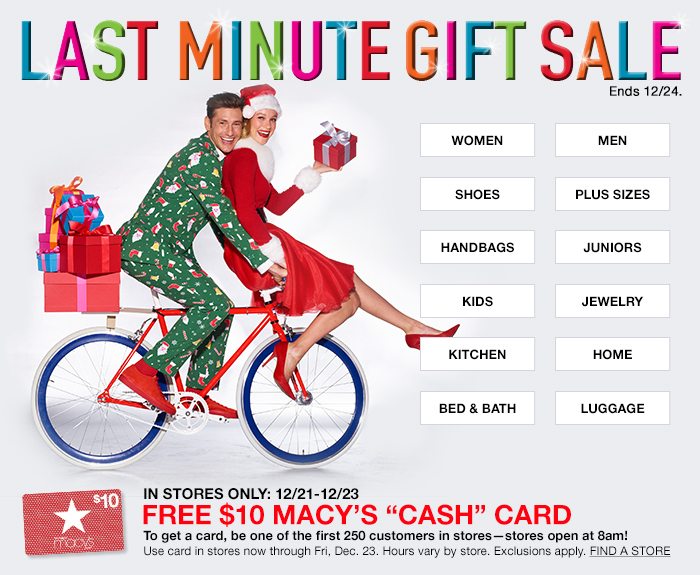 That’s right: in stores only from 12/21-12/23, you can get a free $10 Macy’s “CASH” Card. To get your free Macys Cash Card, just be one of the first 250 customers in the store. Macy’s stores open at 8am these three days, giving you plenty of time to shop and save. And just think about it, you probably get a great parking space too! Don’t delay because not only do you need to be one of the first 250 customer to get your free cash card, you only have until December 23 to spend it. Make sure you verify participation and hours at the Macy’s store closest to you before going. Not only is Macy’s opening early for your last minute holiday shopping, many stores are staying open until Midnight. You can also use the promo code GIFT to take an extra 20% off in most departments. There’s never been a better time to shop AND save at Macy’s!